I love this Asian salad and a couple of my girlfriends make this all the time. 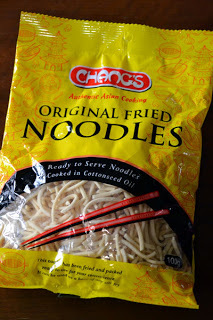 It has now been passed on to me (and anyone else who buy's Chang's original fried noodles). It so summery and has a lovely crunch to it. I could eat this all day everyday and never get sick and tired of the bold flavors in the dressing. I made a couple of minor changes so I can enjoy it the way I like it. Make sure you taste the dressing for you use it to make sure the flavors are balanced. I find I need to add more soy and slightly more sesame oil and a little more vinegar than the packet directs, so this is my modification. 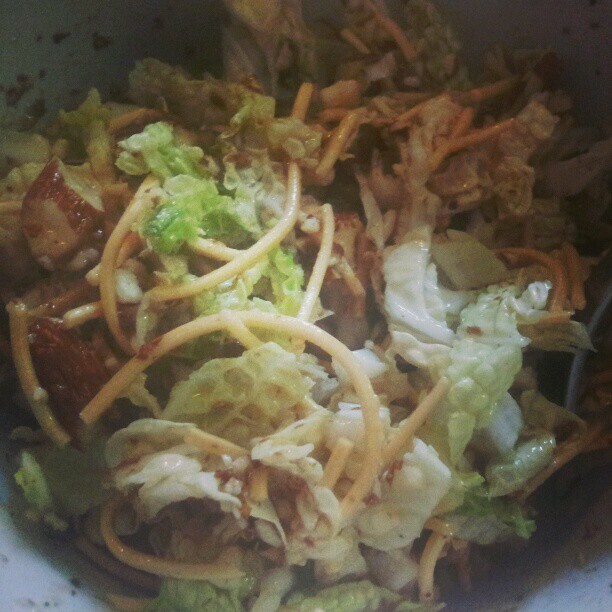 Mix all the salad ingredients in a bowl. Mix all the dressing ingredients in a shakable container (eg something with a tight fitting lid) taste and adjust if needed and dress salad just before eating. This goes well with grilled meats. I add spring onion to mine! Yum!! Spring onion is really good in it! I don't always have it on hand, but may need to start growing some so I can pluck a couple whenever I need it!